Habitation sites existed in and around Polonnaruva and Minneriya from the inception of agricultural settlements in the first millennium B.C. Brahmi inscriptions at places such as Enderagala, Duvegala, Galkandegama Kanda and Mutugala indicate that after the introduction of Buddhism in the third century B.C., these settlements were able to feed a substantial number of monks living in caves around Polonnaruva and Minneriya. Agricultural activities surrounding these areas received a boost after the construction of the Minneri reservoir by Mahasena (274-301) towards the end of the third century A.D. 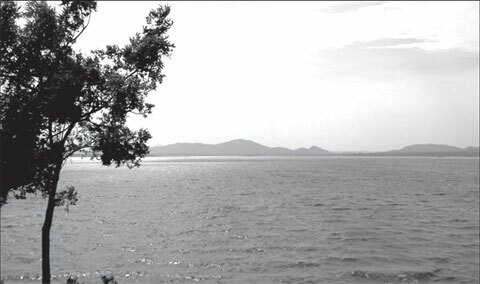 The reservoir is termed Manihira Vapi in Pali texts and Minihiri and Minihoru in Sinhala classics. According to legends, the name Minneri was given to the area because the location was famous for cultivation of grain known as Meneri (Paspalum scrobiculatum). The water source of the reservoir is the 33.5 kilometres long Elahara canal constructed earlier by Vasabha (67-111) by damming the Ambangaga. The canal was enlarged and extended by another 6.5 kilometres by Mahasena. This extended portion of the canal is known as the Talavatu canal. Thus the length of the Elahara-Talavatu canal is 40 kilometres. Minneri reservoir covered an area of 4,670 acres and had an embankment about two kilometres in length and 40 feet in height. It irrigates more than 4,000 acres of paddy land. A canal from the Minneri tank diverted its water to the Kavudulla tank and another canal from the Kavudulla tank augmented the water resources of the Kantale tank. Yet one more canal connected the Kavudulla with the Giritale tank. In fact the Minneri-Giritale-Kavudulla and Kantale complex like many others indicates the interconnection of the ancient irrigation system. The Mahavamsa refers to the repairs done to the Minneri reservoir by kings such as Vijayabahu I (1070-1110) and Parakramabahu I (1153-1186). Nissankamalla’s (1187-1196) inscriptions state that he prohibited fishing in the Minneri reservoir thus making it a sanctuary for fish. After the decline and collapse of the Rajarata civilization in the middle of the thirteenth century, the Minneri reservoir too was neglected and only a very small number of agricultural settlements remained around the reservoir. These and other small settlements in the Dry Zone came under the forest chiefs named Vanniyars but later under the rule of Kandyan kings. The Kandyan kings administered these territories through the Disaves of Nuvarakalaviya and Tamankaduwa. The boundary book - Sri Lankadvipaye Kadaim Pota refers to 44 settlement units in Rajarata and mentions Minneri as one of them. When the British held sway over the coastal areas, they established an army stronghold in 1803 at Minneriya to control the Eastern territory. But as soldiers suffered from malaria, it was removed within no time. After the Kandyan Convention of March 1815, they brought the region under the control of the Government Agent of Minneriya. As the British did not honour the Kandyan Convention there was unrest in the country and once again a military post was established at Minneriya. But due to bad environmental conditions for health it was also removed. A few years later the British government assigned the duties of 'Collector' at Trincomalee and Government Agent of Tamankaduwa to one person and his main office was established at Minneriya. However subsequently, it was removed to Puliyankadawala 22.5 kilometres away from Minneriya, once again due to the spread of malaria. The British administrators and surveyors observed in the nineteenth century that many ancient reservoirs were in disrepair and unusable and dams were breached. But the Minneriya reservoir was an exception. Emerson Tennent, the British colonial secretary for Ceylon, who visited Tamankaduwa in 1848 reported that Minneriya tank bund was in a perfect condition though overgrown with trees. Governor Henry Ward on a visit to Giritale and Minneriya in 1856 made an entry in his diary stating that a canal from Minneriya irrigated some paddy lands below the reservoir. Thus it is clear that irrespective of the breakdown of the Rajarata civilization, a small number of habitation sites continued to function throughout history. Henry Ward was of the opinion that without repairs to the reservoir a colonization scheme could be started at Minneriya. Nevertheless, the Minneri reservoir had to be repaired before the commencement of any meaningful colonization scheme. As a result, the reservoir was restored in 1902 and experiments in bringing settlers from outside were conducted. But once again malaria was rampant and prevented the establishment of a successful settlement scheme. As there was global food scarcity during and after the First World War, even voluntary organizations came forward to develop Dry Zone agriculture. An organization called the Minneriya Development Company undertook to develop 9,000 acres at Minneriya in 1919. The company was of the opinion that by using machinery, paddy cultivation could be improved as a commercial venture. But due to certain practical problems as well as the spread of malaria the task was abandoned and the company was dissolved in 1921. In the following year, another organization, the 'Lanka Mahajana Sabha' ventured into the task of colonization of lands in Minneriya, but that effort too ended in failure. Subsequently D.S. Senanayake, Minister for Land and Agriculture proposed in the State Council that colonization schemes should be established at any cost to overcome food scarcity. In response, the government appointed a three member Committee and its report was submitted in 1932. The report emphasized the need to develop the Dry Zone and the importance of settling landless peasants of the Wet Zone and the Intermediate Zone in the Colonization Schemes. It further recommended the clearance of the Dry Zone land, establishment of road, canal and health facilities and the allocation of land without charging any fee from the settlers. The settlers were expected to build their own homes. According to this scheme even the middle class was entitled to free land in the Minneriya scheme. It was D.S. Senanayake as Minister of Lands and Agriculture who gave leadership continuously to develop 50,000 acres of land at Minneriya. The first group of land recipients under this scheme arrived at Minneriya on April 30,1933. But as D.S. Senanayake himself admitted, some of the recipients of colony lands were unsuccessful as cultivators. Some died of malaria. Therefore from 1936 onwards, the government adopted a policy of paying money to new settlers to clear the land as well as to build houses. They were given six acres of wet land and 2.5 acres of dry land. Money paid to them was an outright grant and was not to be recovered. As a result between 1936 and 1940, landless peasants as well as some middle class people of the Wet and Intermediate Zones were settled in Minneriya. Since then the Minneriya Colonization scheme became successful and a complex settlement pattern evolved of which 90 percent were agricultural settlements.